The X class was a World War II midget submarine class built for the Royal Navy during 1942–44. 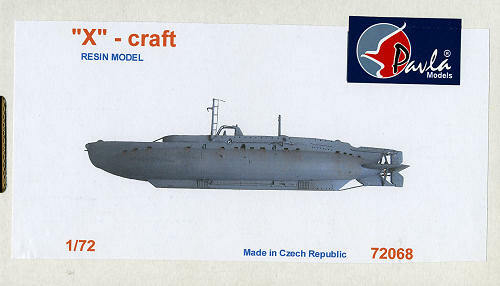 Known individually as X-Craft, the vessels were designed to be towed to their intended area of operations by a full-size 'mother' submarine - (usually one of the T class or S class) - with apassage crew on board, the operational crew being transferred from the towing submarine to the X-Craft by dinghy when the operational area was reached, the passage crew returning with the dinghy to the towing submarine. Once the attack was over, the X-Craft would rendezvous with the towing submarine and then be towed home. Range was limited primarily by the endurance and determination of their crews, but was thought to be up to 14 days in the craft or 1,500 miles (2,400 km) distance after suitable training. Actual range of the X-Craft itself was 500 nmi (926 km) surfaced and 82 nmi (152 km) at 2 knots submerged. The craft were about 51 feet (15.5 m) long, 5.5 feet (1.68 m) in maximum diameter and displaced 27 tons surfaced and 30 tons submerged. Propulsion was by a 4-cylinder Gardner 42 hpdiesel engine, converted from a type used in London buses, and a 30 hp electric motor, giving a maximum surface speed of 6.5 knots (12 km/h), and a submerged speed of 5.5 knots (10.1 km/h). The crew initially numbered three—commander, pilot and ERA—but soon a specialist diver was added, for which an airlock, known as a wet and dry compartment, was provided. The X class submarines' weapons were two side-cargoes - explosive charges held on opposite sides of the hull with two tons of amatol in each. The intention was to drop these on the sea bed underneath the target then creep away. The charges were set off by a time fuze. Pavla's kit is a full resin construction with no deals. The hull comprises two halves on which a flat deck section is attached. My halves were of a slightly different length, but nothing that can't be fixed with a bit of filler or sanding. Other largeish pieces are the upper deck section, Fins for the rear along with the rudders and two hatches. There are also a myriad of fittings and guards, all finely done in resin. The builder will need to stretch sprue or cut wire for the ladder type construct near the front. Overall the resin is very nicely formed and though there is a bit of flash, it is fine stuff and easily removed. 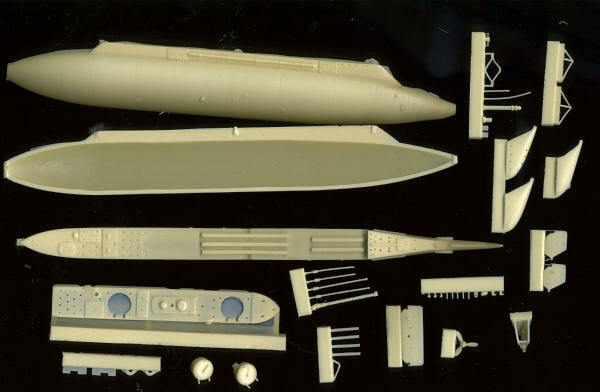 Most all aircraft modelers like to build submarines, as much due to the simplicity of most of these kits as anything else. For those who want something different from the usual Type VII, Gato, and Los Angeles class submersibles that seem to dominate contest tables, this would be the one for you.